Its mother has long since departed the scene. 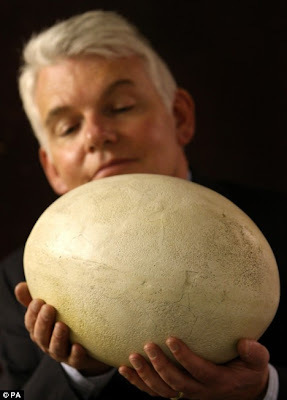 As, indeed, has its entire species.But this giant egg is a great survivor. It was laid around 400 years ago by one of the great elephant birds of Madagascar.Before becoming extinct in the 17th century, the flightless creature was the world's largest bird, standing 10ft tall and weighing half a ton.World. 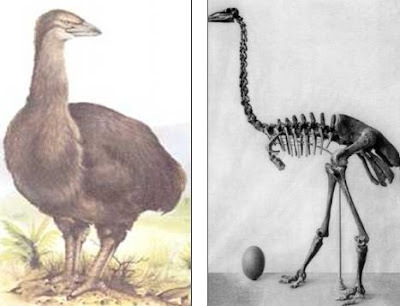 Elephant birds became extinct after being hunted by the natives of Madagascar.Even though the bird weighed about half a ton, it also suffered at the hands of other predators such as pigs who ate their chicks and destroyed their eggs.The flightless bird, the largest to have ever lived, resembled a heavily-built ostrich. 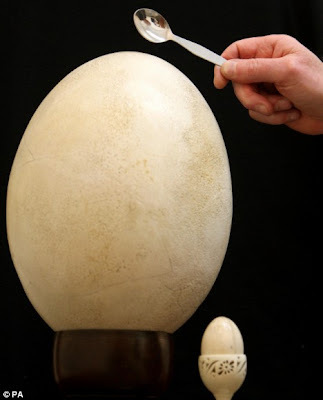 It had long legs, talons and stood at more than 10ft tall.But despite its fearsome appearance, it was a herbivore.World Largest Egg. The bird as it would have looked 400 years ago, and right its skeleton reveals how much larger it was compared to its giant eggs.